Tate County is home to advanced manufacturing and distribution companies and has many business service companies. Here are several reasons why your business should be here. 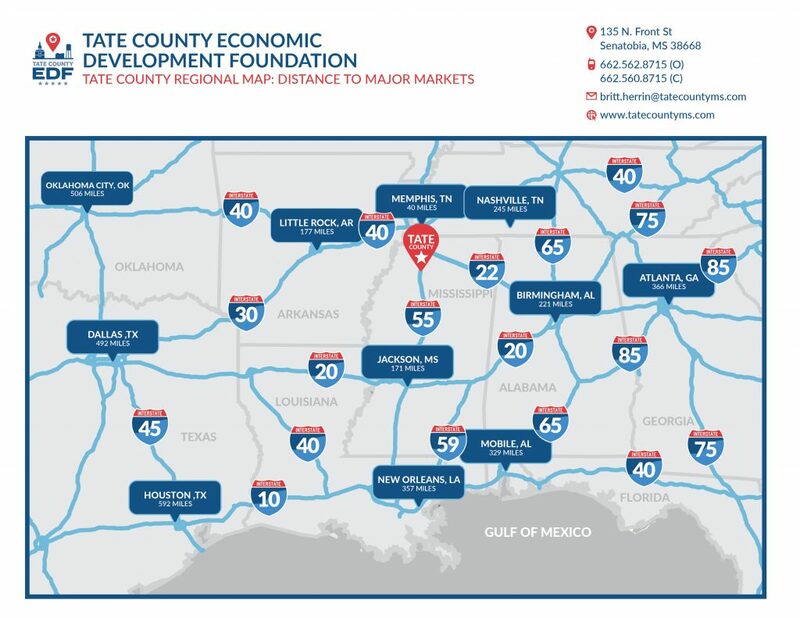 Tate County business and industry can supply 75% of the United States, Canada, and Mexico markets from Tate County, in a 20 hour truck drive. The Senatobia Industrial Park is a publicly-owned industrial park strategically located at I-55 Exit 263, a modern interchange designed for extensive truck traffic. 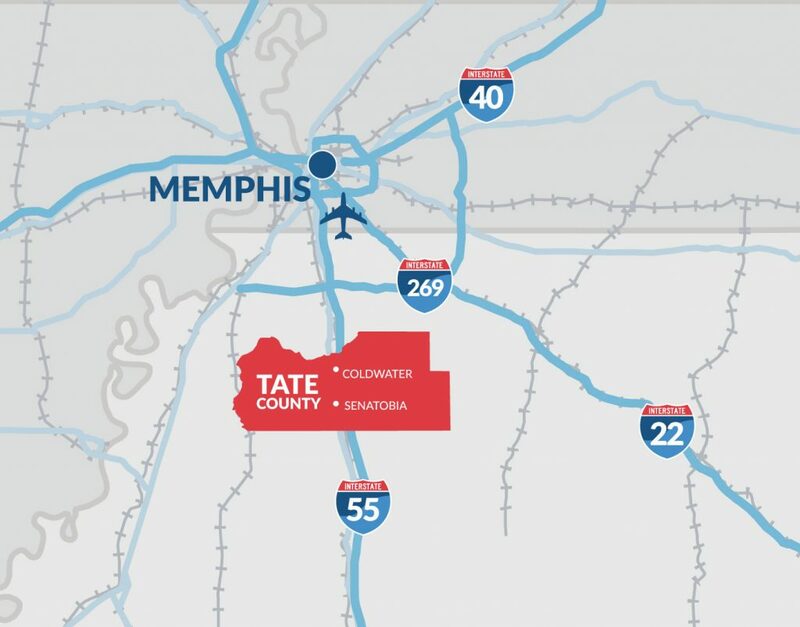 The Park, along with other privately owned industrial property in Tate County is located 30 minutes from the Memphis International Airport, and the FedEx Global Hub The Senatobia Industrial Park has rail access via Grenada Railway, and is located in a Foreign Trade Zone (FTZ 158). Electricity is provided by Entergy, with Gas, Water, and Sewerage provided by the City of Senatobia. Fiber access is available in the park from AT&T, Comcast, and Cspire. ABB, Calbee Foods and PK-USA, all prominent international companies, are located in the park in addition to Carlisle SynTech, and several other local industrial and distribution companies, Additionally, the Industrial Park is only 5 minutes from Northwest Mississippi Community College, with its world class industrial and technical training facility. The University of Mississippi, which houses the award winning Haley Barbour Center for Manufacturing Excellence, is only 35 minutes away. The Center for Manufacturing Excellence at the nearby University of Mississippi, ABET-accredited undergraduate degree programs at nearby universities, and workforce training programs at Northwest Community College means talented workers are well-prepared for manufacturing and industrial jobs. Tate County offers highly competitive tax exemptions and other local incentives. Read more about local incentives. The cost of doing business in Tate County is very appealing. Tate County has comparatively low cost of doing business based upon utility, and labor costs, as well as more affordably priced land, facilities, housing, and other amenities. Northwest Mississippi Community College, located in Senatobia provides many services to meet the workforce needs of Tate County Business and Industry. A.M.P. stands for Advanced Manufacturing Partnership. Industries across North Mississippi are in great need of highly skilled electronics engineering technicians to help keep their advanced manufacturing set ups running smoothly. There is such a need for these skilled workers that Northwest established a partnership with many area industries to provide paid interns from their Industrial Electronics Engineering Technology program. The 47,000-square-foot Center for Manufacturing Excellence provides undergraduate interdisciplinary education in manufacturing. Courses are offered through the schools of Business Administration, Accountancy, and Engineering. Students work together in classes and on the 12,000-square-foot shop floor to develop products and address manufacturing problems. The Center is located in Oxford, Mississippi, on the University of Mississippi campus. The Center also offers extension and training programs to Mississippi manufacturing companies and collaborates with K-12 schools and community colleges to develop programs. Advanced Manufacturing & Electronics: ABB develops and produces ABB Tmax XT circuit breakers. Other productions manufactured in Senatobia include the company’s Emax 2 Breakers, TruONE Automatic Transfer Switch assemblies and other electrical switches. Food Processing: Calbee is one of the largest snack & food manufacturers in Japan. It supplies snack foods for the U.S. market from its manufacturing and distribution facility in Senatobia. Building Materials: Carlisle Syntech manufacturers advanced composite roofing materials for a worldwide customer base. For a list of existing businesses that are top employers in Tate County, visit our Existing Industry page. Learn more about advanced manufacturing in Mississippi. The Mississippi Automotive Manufacturers Association acts as a forum for communication and cooperation among automotive manufacturing companies in Mississippi to promote the growth and development of the industry. The Mississippi Manufacturer’s Association advocates for and provides support for the manufacturing industry in Mississippi. The state of Mississippi offers financial incentives to manufacturers expanding or locating to Mississippi. View the list of tax incentives. These tax incentives can be combined with other business incentive programs. Click here for a full list of State tax exemptions, incentives, and credits. 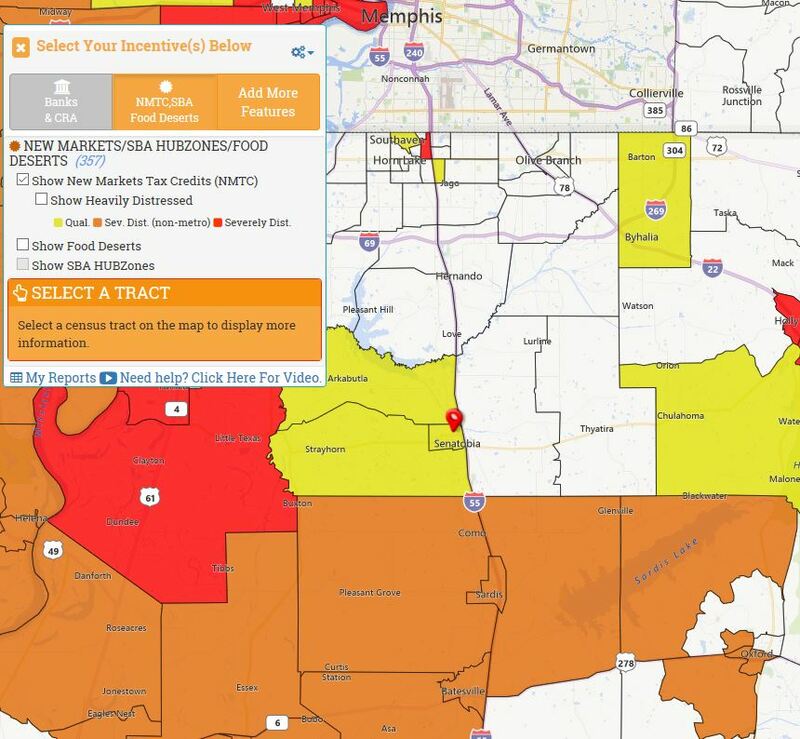 Portions Tate County is part of the federally designated Opportunity Zone Program. The Opportunity Zones incentive is a new community investment tool established by Congress in the Tax Cuts and Jobs Act of 2017 to encourage long-term investments in low-income urban and rural communities nationwide. Opportunity Zones provide a tax incentive for investors to re-invest their unrealized capital gains into dedicated Opportunity Funds. Portions of Tate County qualify for the federal New Markets Tax Credit program (NMTC). The NMTC Program attracts private capital into low-income communities by permitting individual and corporate investors to receive a tax credit against their federal income tax in exchange for making equity investments in specialized financial intermediaries called Community Development Entities (CDEs). The credit totals 39 percent of the original investment amount and is claimed over a period of seven years.